A man prays at La Placita Catholic Church in Los Angeles. The first mass wave of emigration from Mexico took place during the 1910s and 1920s as Mexicans fled political and economic turmoil at home for work in U.S. agriculture and railroads. By 1929, an estimated 738,500 people of Mexican birth lived in the United States. Many of them migrated seasonally. Within Mexico, most elites opposed the mass migration of its people, the country's largest asset, to the United States. The strongest sentiment against emigration during this period came from the Catholic Church, an influential voice in a country where more than 98 percent of the population identified as Catholic even as the Church continued to lose its long and bloody struggles with the government. The Church feared that migration caused the breakup of families, religious conversions, and the introduction of dangerous foreign ideas. However, the Church's various attempts to prevent migration northward largely failed. By the 1960s, its migration policy shifted to preparing migrants for the journey, establishing closer ties with the Church in the United States, and becoming a voice for migrants' rights while encouraging both their U.S. integration and homeland ties. With 88 percent of Mexicans older than age 4 being Catholic in 2000 according to INEGI, Mexico's official statistical agency, the Church continues to play an important role in the migration experience even as the number of evangelical Christians grows. This article, based on a chapter from the recent book A Nation of Emigrants: How Mexico Manages Its Migration, explores these changes in Church policy and the circumstances that shaped them. It also examines the effects these policies have had on Mexican migration and on the migration policies of the Mexican government. In 1920, the Archbishop of Guadalajara, in central Mexico, called for a "holy crusade" against emigration in a circular read aloud in Sunday mass throughout the archdiocese and published under the banner headline "Against Emigration" in the regional Catholic weekly. The following year, a weeklong conference in Guadalajara on agrarian problems developed a national Church response to emigration. In the evocative language of the keynote address, emigration "is a demolishing act, a devouring act, an act that every day rips shreds of flesh and soul from the motherland." In the eyes of the Church hierarchy, emigration entailed numerous perils. The first was returnees' foreign ideas and U.S. attachments. These ideas endangered the purity of Mexican culture and even Mexico's very existence as a sovereign state. Despite pervasive discrimination against Mexicans in the United States, migrants came back to Mexico with impossibly high expectations of wages and working conditions that generated an agrarian radicalism the Church bitterly opposed. The parish priest of San Juan de los Lagos reported in 1920 that returnees were introducing anarchist ideologies learned in the United States. Memories of the 1848 annexation of what became the Southwestern United States were still fresh in the 1920s, and fears that migrants would make invidious comparisons between Mexico and the United States were not unfounded. In his 1931 study of Arandas, a town in the state of Jalisco, Berkeley economist Paul S. Taylor found that returnees had a much more positive view of the United States than residents who never left. In the eyes of the Church, family disintegration was the second major problem emigration caused. Husbands returned to Mexico to find their households in ruin with "wife or daughter dishonored" and "sons abandoned to their instincts, prepared for crime." A mostly male migration left women back home "unprotected" and exposed to the temptations of infidelity and even prostitution when men did not provide for their families. Family separation threatened nationalist as well as gendered obligations. In the conference presenter's view, the absence of fathers and husbands "crumbled," "destroyed," "split in half," and "annihilated" the worker's family — the basic unit of society's moral and material strength. By threatening the worker's family, emigration threatened Mexico herself. Religious apathy or conversion was the third set of problems emigration caused. According to Church records from the 1920s, migrants in the United States lost their faith because few priests could minister to them in Spanish and Protestant missionaries took advantage of Catholic weakness by offering needy migrants relief in exchange for conversion. The Catholic clergy argued that Catholic migrants were vulnerable because migrants identified Protestantism with the power and prestige of the United States. The United States was an inherently dangerous religious environment because of its "cosmopolitanism." Another argument against emigration, which was not made publicly, was that material progress would weaken religious sentiment. A Guadalajara priest complained to Taylor in 1931 about workers returning from the North with newfound wealth. "When the Indian wears shoes, he does not go to mass. And when he wears pants, he does not believe in God," he said. The economic effect of emigration was also seen as threatening, not least because it eroded the tithe base. Labor shortages jeopardized production of agricultural goods and primary industrial materials. For the archbishop, the emigration of Mexico's workers was especially egregious because they were being lost to Mexico's northern nemesis. His position followed the mercantilist logic that population is a source of national strength that should be protected from the predations of foreign competitors. The demographic disaster of the 1910-1920 revolution — in which an estimated 1.4 million died and hundreds of thousands fled north — and ongoing tensions with the United States made retaining population all the more important for Mexico. Emigration's challenge to the Church was renewed during the Bracero program, which was meant to ease U.S. labor shortages during World War II. From 1942 to 1964, the U.S. and Mexican governments negotiated a series of temporary worker agreements providing 4.6 million Bracero contracts (not individuals) for agricultural work. American authorities made five million apprehensions of unauthorized migrants during the same period. The Archbishop of Guadalajara told priests in 1951 to warn prospective migrants of the spiritual and material dangers facing them in the United States, "so they will not abandon their homes, families, work, and motherland for this adventure." He said the public should be warned that illegal immigrants went hungry waiting for false promises of contracts. Even the legally contracted "live in miserable pigsties, face high costs, are taken out by brute force to work on rainy days, and are given opportunities to spend what they earn on vices." By 1960, the clergy recognized that simply telling workers to stay home was not working. In many Mexican communities, a trip to work in the United States had become a rite of passage for young men. The Church's policy changed from simple dissuasion to a campaign to prepare braceros heading north for the moral dangers they would face. A new campaign included a "Manual for Braceros," special masses and charity in Mexican contracting centers, and a "Bracero Hour" radio broadcast about conditions in the United States. The trend continued towards a greater emphasis on managing emigration's effects rather than hindering departure. When it became clear that the United States would not renew the Bracero program, the emigrant commission of the Conference of Mexican Bishops (CEM) met to plan the Church's response (CEM coordinates the Church's social and pastoral policy). The Church leadership understood that migration patterns were already beginning to change from circular migration — movement back and forth across the border — toward permanent settlement in the United States. CEM decided in the 1960s to promote a Pastoral Tour of Mexico to bring U.S. priests south for three to six months; the tour included visits to historic migrant-sending regions. Permanent emigrants represented a different kind of challenge to the Mexican Catholic Church than seasonal migrants who had regular contact with priests in Mexico. Priests based in the United States, supplemented by visiting Mexican clergy, now had to do the heavy pastoral lifting. Yet post-Bracero migration networks opened new opportunities for local Mexican priests because these networks concentrated migrants in a handful of U.S. destinations. Migrants' preference for priests familiar with their language, hometown patron saints, and local religious expressions created the conditions for priests in parishes of origin to maintain ties with those abroad. After the Bracero program ended, illegal migration to the United States rose quickly, from about 11,000 apprehensions along the border in 1964 to 243,000 in 1974. As a result, the human rights of unauthorized migrants became ever more important to the Church. The Catholic hierarchy's response to migration around the world reveals two axes of Church organization that have coexisted uneasily at least since the Fourth Lateran Council of 1215. Along one axis, the Church is divided into territorial districts for administrative purposes, but it is otherwise a transnational organization for which national differences are irrelevant. Along another axis, the Church is divided by nationality or the language of the faithful, rather than simply their place of residence. Until 1887, when Bishop Giovanni Battista Scalabrini founded the Missionaries of St. Charles to minister to Italian migrants in the United States, a territorial organizational model prevailed in most immigrant-destination countries. Today, the Scalabrinians are a transnational order that operates migrant ministries and research centers around the world, including a center in New York that publishes the premier migration studies journal, International Migration Review. In Mexico, Scalabrinians institutionalized a more universal outlook on international migration than existed in the country prior to their arrival in the 1980s. Following meetings between U.S. and Mexican bishops, the Missionaries of St. Charles (the Scalabrinians — see sidebar) opened a seminary in Guadalajara in 1980 to attend to migrants in transit, prepare priests for ministering to the growing Latino population in the United States, and convince the Mexican Church to develop a more consistent policy toward emigrants. The desire to cooperate across borders has also come from the Vatican, particularly following the Second Vatican Council in 1962. Both the Mexican and U.S. branches have followed the Vatican in enthusiastically taking up the global rights revolution demanding an expanding list of protections and privileges based on universal rights of personhood. Priests on Mexico's northern border were most intensely involved in Church migration policy during the 1970s and 1980s. They publicly denounced abuses of unauthorized migrants and beginning in 1987 established a chain of shelters to minister to migrants in border cities. In the heyday of massive illegal migration from Tijuana to San Diego in the late 1980s, Scalabrinian priests held daily outdoor masses in the shadow of the border fence to bless the scores of migrants waiting for nightfall to cross. The shelters now mostly serve deportees. By the turn of the millennium, the migration policies of the Mexican and U.S. episcopates (body of bishops) had almost completely converged to a strong transnationalist stance. A 2002 joint pastoral letter began by declaring, "We speak as two episcopal conferences but as one Church, united in the view that migration between our two nations is necessary and beneficial." The letter is one of the Church's clearest justifications of a right to emigrate and immigrate. But while it promoted universal rights, the Mexican Church continued to worry about emigration's effects on Mexican culture and the economy. CEM, in fact, has argued that emigration and immigration are qualified human rights that do not exempt citizens from their communal obligations. Especially in poor regions, the emigration of productive forces and "those gifted with genius and skill" are blamed for depriving the community of the "material and spiritual benefits it needs." 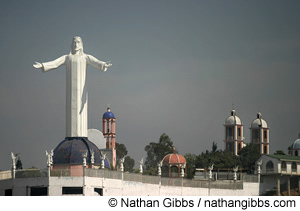 A statue of Jesus overlooks Tijuana from a hillside above the city. Church shelters in Tijuana today mainly serve Mexican citizens deported from the United States. The editorial board of Migrantes, the Scalabrinian seminary's weekly, in the 1980s rejected the consensus that emigration was an escape valve for a Mexican economy that could not provide enough jobs for its workers. The magazine portrayed temporary migration, permanent settlement abroad, and repatriation as detrimental to Mexico. In recent years, the Catholic Church on both sides of the border has made more efforts to deepen migrants' social ties to both their places of origin and settlement. The Church promotes cross-border ties and hometown solidarity more generally through its role in U.S.-based hometown associations (HTAs), organizations that allow immigrants from the same city or region to maintain ties with and materially support their places of origin. As many HTAs make renovating the church or sponsoring a charity back home their first project, a priest in the parish of origin often acts as a coordinator or trusted conduit for the donations. The Church hierarchy frowns on fundraising outside of formal channels, but it remains common among priests at the local level in areas with high levels of emigration. Migrants are intensely devoted to local patron saints, providing another opportunity for the Church to foster ties. With religious fiestas structuring the calendar of temporary returns to Mexico (mainly December and January), the Church hierarchy holds activities during fiestas that cater to migrants and welcome them home. The Mexican government estimated in 2008 that more than a million migrants return for the holidays every year. And when Mexican parish priests visit their U.S. satellite communities with an image of the patron saint — the latter a practice the binational Church hierarchy encourages — they bring together Mexicans who might not otherwise see each other. During these visits, migrants usually organize a mass or party in someone's backyard or a public park, where the visiting priest may even baptize a baby or celebrate a first communion. Since berating settled migrants for betraying the motherland might prompt them to leave the Church altogether, the nationalism the Mexican Church has espoused since the Bracero program is a soft, cultural nationalism based on positive affirmations of being Mexican and devotees of the Virgin of Guadalupe. In the United States, the Church has carried out a pluralistic cultural mission among Mexicans in the United States since the 1960s. It is learning to adapt to an influx of newcomers, even in places like Georgia that historically have not been Mexican destinations. Disdain for Mexicans or immigrants is no longer culturally acceptable or strategically prudent given that Latinos constitute a rapidly growing part of the Church's membership. The Church now promotes immigrants' native language by holding masses in Spanish and recruiting Spanish-speaking priests, but it also encourages immigrants to become U.S. citizens and learn English. Americanizing and maintaining mexicanidad are viewed as complementary. Still, the Mexican Church has a "national" face even as cooperation with U.S. clergy strengthens. Particularly in migrant-sending regions, many clergy continue to be concerned about migrants introducing cultural ideas from the United States. How the Church confronts migration leads to two questions: how its policies have shaped migration between Mexico and the United States and how its policies have affected government policy. The Church's dissuasion policy — which the government adopted around the same time — was a failure. Despite parallel but generally uncoordinated efforts that included propaganda campaigns, money for repatriating migrants, and job-search help for those who returned, the number of Mexicans in the United States actually increased about 45 percent during the 1920s crusade from an estimated 509,500 in 1921 to 738,500 in 1929. It is hard to assess the counterfactual question of whether migration would have been even greater had the Church not opposed it, but the decimation of Mexico's population suggests that dissuasion was futile. The Church's decision to help those who decide to migrate has arguably eased the path for travelers who cannot rely on a social network of experienced migrants from their hometown or family. Along with travel agents, human smugglers, immigration lawyers, and labor brokers, Catholic organizations offering refuge along the border are important nongovernmental actors that enable international migration. Although the Church and the government both promote remittances, their rationales differ. The Church has always emphasized migrants' responsibility to provide for families left behind; the government, with particular intensity since the 1990s, has emphasized investments rather than consumption. An end to remittances would be a financial disaster for many parishes. One of the proposals to the Mexican government in a meeting between Mexican Church officials and then President Vicente Fox in 2003 was to reduce remittance transfer fees, a goal already the Mexican government already shared. Most importantly, the Catholic Church has become one of the major interest groups in the United States and around the world promoting a more accommodating stance toward immigration even when such positions have been politically unpopular. In terms of U.S. immigration reform, the Mexican and U.S. episcopates have adopted the Mexican government's policy positions — such as legalization for most of the unauthorized migrants in the United States and a temporary worker program — though they also criticize the Mexican government for abusing Central Americans in transit through Mexico. The Church in Mexico has called for targeted development projects in migrant-source regions to create economic alternatives to migration and matching-fund programs, which multiply remittances, to generate investment in migrant-source communities. Other areas of Church policy in Mexico, such as encouraging migrants to return for religious fiestas, have clear consequences. Historically, apprehensions by the U.S. Border Patrol have spiked immediately after the winter religious fiesta cycle when migrants return to work. Communities with patron saint fiestas outside the modal months of December and January receive the greatest number of returns during their fiestas, providing strong evidence that the fiesta effect on the migration calendar is independent of the agricultural cycle or other seasonal conditions. The pull of the fiestas has weakened since the advent of concentrated border enforcement in the mid-1990s, however, as fewer unauthorized migrants are willing to return to their hometowns and then incur the high smuggling fees and physical risks of illegally reentering the United States afterward. Because religious fiestas attract so many migrants, the state has piggybacked on these events by either cooperating with local priests, or, in some communities, attempting to shift the focus toward a secular fiesta. In both cases, religious fiestas predate the government's secular involvement. Fiestas are advantageous from the state's point of view because they promote permanent emigration with continued homeland ties and tourism. The government considers this combination the best recipe for attracting remittances and forming a Mexican lobby to press its trade and immigration policy preferences in the United States. While the Church and the government do not always share the same goals — the Church still worries about migration's moral effects and the government wants to secure migrants' political support — they use similar techniques to govern a mobile population. The reason for these techniques is simple: Church and state exercise their power through knowledge about the whole population as well as its individual members. Both organizations survey migrants to determine their demographic characteristics, legal status, migration routes, U.S. destinations, and occupations. Each tries to document the amounts of collective remittances; how they are spent; and the names, addresses, and telephone numbers of the remitters. Just as the Mexican state has at times issued identification documents that also attest to the bearer's moral character, on a smaller scale, priests in Mexico have issued ecclesiastical identification documents and letters of introduction to destination parishes. At the local level, the Church often has better records than the state, given that local government bureaucracy is shot through with clientelism, lack of continuity between administrations, and corruption. The state imitates the Church's administrative methods by building on an existing system of baptismal registries to record births and by following the Church's model of creating directories of migrants from particular hometowns. The Church's transnational structure and universalist face make embracing its mobile members easier. Mexican consulates attempt similar coverage, but U.S. sovereignty limits the Mexican government's capacity to accomplish this goal. The Catholic Church continues to be one of the major voices for comprehensive immigration reform in the United States. The hierarchy and clergy are leading their flock on these issues, as there is scattered evidence that U.S. Catholics' attitudes toward immigration are about as restrictive as those of non-Catholics. Although immigration faded as an issue in the 2008 presidential campaign once the Republican primaries concluded, U.S. bishops have tried to put a more accommodating policy approach back on the political agenda through conferences, tours, and the use of the homily as a bully pulpit. The Church is increasingly working with likeminded groups from other religious organizations. A path to legalization, family reunification, humane border control and interior enforcement policies, and development in Mexico remain the pillars of the Church's policy on both sides of the border. Archivo de la Arquidiócesis de Guadalajara (AAG), CEM, 1960. Archivo de la Parroquia de San Juan de los Lagos, Libro de Gobierno, July 6, 1920. Curso Social Agrícola Zapopano, 1921:231. Camp, Roderic Ai. 1997. Crossing Swords: Politics and Religion in Mexico. New York: Oxford University Press. "Curso Social Agrícola Zapopano desarrollado en Guadalajara, con ocasión de la pontificia coronación de la imagen de Ntra. Sra. de Zapopan, en enero de 1921, bajo los auspicios del 5o Arzobispado de Guadalajara. Breve historia. Trabajos. Nómina de semaneros. Con licencia de la Autoridad Eclesiástica." 1921. Guadalajara: Renacimiento. Craig, Ann L. 1983. The First Agraristas: An Oral History of a Mexican Agrarian Reform Movement. Berkeley: University of California Press. La Época,[Guadalajara]. Sep. 12, 1920. Espinosa, Víctor M. 1999. "El día del emigrante y el retorno del purgatorio: iglesia, migración a los Estados Unidos y cambio sociocultural en un pueblo de Los Altos de Jalisco." Estudios Sociológicos 17(50):375-418. Hagan, Jacqueline Maria. 2008. Migration Miracle: Faith, Hope, and Meaning on the Undocumented Journey. INEGI (Instituto Nacional de Estadística, Geografía e Informática). 2000. XII Censo General de Población y Vivienda. Available online. McCaa, Robert. 2003. "Missing Millions: The Demographic Costs of the Mexican Revolution." Mexican Studies/Estudios Mexicanos 19:367-400. Odem, Mary E. 2004. "Our Lady of Guadalupe in the New South: Latino Immigrants and the Politics of Integration in the Catholic Church." Journal of American Ethnic History 21(4): 26-57. Paul Schuster Taylor Papers, University of California, Berkeley, Bancroft Library, Series 2, Ctn 1, Field Notes 1:22, 1931-1932. U.S. Immigration and Naturalization Service, Yearbook of Immigration Statistics, various years. Zizzamia, Alba. 1989. A Vision Unfolding: The Scalabrinians in North America (1888-1988). Staten Island, NY: Center for Migration Studies; Espinosa 1999. David Fitzgerald is the Co-Director of the Center for Comparative Immigration Studies Theodore E. Gildred Chair in U.S.-Mexican Relations, and Associate Professor of Sociology at the University of California at San Diego.